At Finger Lake the trail drops sharply onto Red Lake leaving the lake at the northwest corner. It climbs steeply leaving the lake at the northwest corner. It climbs steeply up a small creek bed to the benches above Finger Lake. From here it is through swamps, spruce and alder forest to Happy River. The two miles before Happy River are through dense spruce. At Happy River there are three benches to descend with the first being the longest drop, known as the “Steps”. A small drainage leads down to the level bench and the trail drops straight down this “V”. From this bench the trail descends off the right end to the bench along the river. The last drop is onto the river itself. This section is one of the most hazardous on the trail and extreme caution must be exercised here. The trail will be well marked and the descents will have a straight lead-in. In 2012 the trail will be routed around the famous “Steps” due to a road that was created by a mineral exploration company. This trail re-routing is not yet a permanent change. Once on the river itself, the trail turns left to the mount (200′) and then right, going up the Skwentna River. Approximately 1/4 mile up the Skwentna is a draw coming down from the right and the trail goes up this draw. A ramp may have to be constructed because the bank has washed away leaving a cut bank four to eight feet high. Once into the draw, stay to the right side as the left side leads to a vertical wall 6′ high and is impassable. The draw is only 125 – 150 yards long and once on top the trail continues northwest to Shirley Lake passing through spruce and cottonwood and rolling hills. No grades are steep or long. The steepest grade is up the draw from the Skwentna River. The trail exits Shirley Lake on the northwest side and continues through spruce and cottonwood to Round Mountain. There are some moderate but short grades and a couple of steep but short grades both up and down. At Round Mountain a side hill is encountered and brush is encroaching on the trail. From here to Puntilla Lake is a distance of three to four miles and is gentle terrain with open swamps and sparse timber. Rainy Pass — (RP) Lat 62.10 Long 152.43 — Population 2 — This area represents the highest point on the Iditarod Trail as it passes over the majestic Alaska Range. Located on Puntilla Lake is Vern Humble’s guiding operation. Known as Rainy Pass Lodge, it is closed down at this time of year. 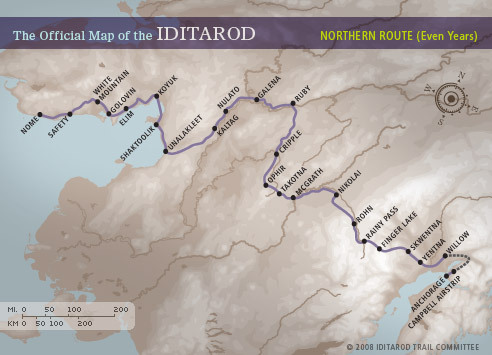 Iditarod uses one of their cabins for a checkpoint and another for mushers to rest in.